Have you ever imagined you were sitting on a cloud, sun shining in your face and truly enjoying the moment? I have. In fact, this is the image that came to my mind, after taking the first bite of this delicious dessert. Pure heaven! It’s creamy and silky, just sweet enough and the vanilla shines through beautifully. 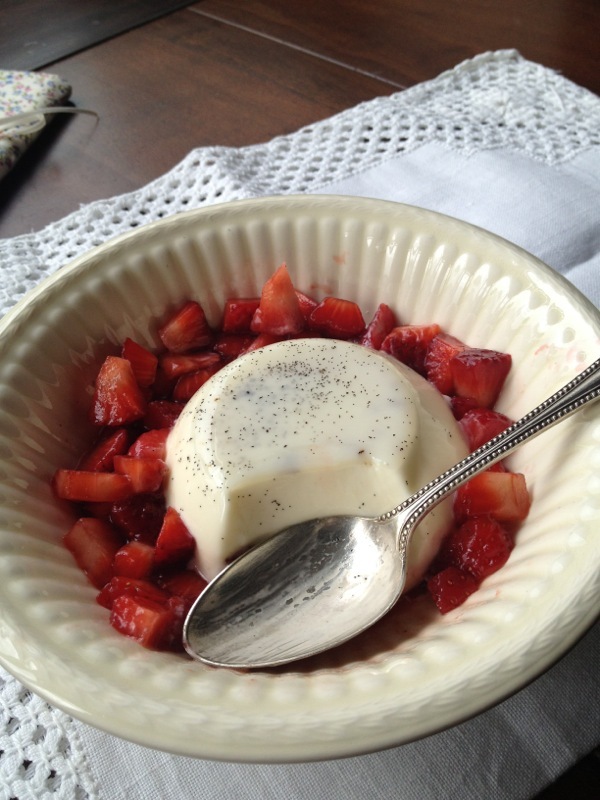 Plus, the balsamic strawberries counterbalance all of the characteristics of the panna cotta really well. And of course, it’s no surprise from whom I got this recipe. Misses Domestic Goddess herself; Mrs. Nigella Lawson. Combine the cream and milk into a saucepan. Stir in the sugar. Remove the seeds from the vanilla pod. I do this by taking a sharp knife and slicing the pod open en then using the sharp side of the knife to scrape out the seeds. Add the seeds of the vanilla pod and the pod itself to the saucepan. Put over low heat. While this is ever so gently heating and comes to the boil, in the meantime, put the gelatine into a shallow dish of cold water to soften (about 3 minutes). When the cream mixture comes to a boil (when it is beginning to bubble/foam around the edges), take the pan off heat. Remove the vanilla pod and pour about a cupful into a heatproof jug. Take the gelatin leafs from the dish and squeeze them a bit to remove the excess water. Add the gelatin leafs to the heatproof jug and whisk. Once the gelatine has dissolved, pour the mixture from the jug back into the saucepan and whisk. Then pour the mixture back into the jug and evenly divide the mixture into the dariole moulds. Refrigerate for at least six hours or overnight (cover each dariole mould with cling film once cool enough). 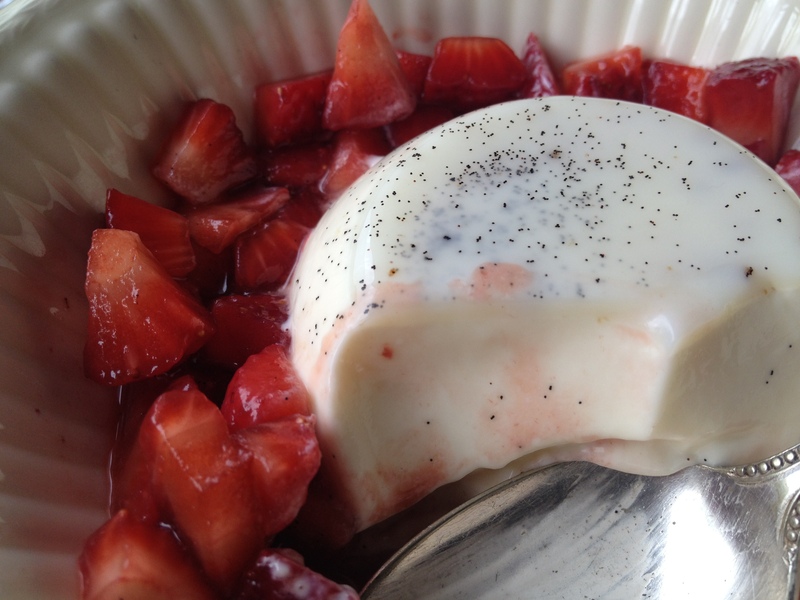 To make the macerated strawberries, dice the strawberries finely and add the sugar and balsamic vinegar. Allow to steep for at least 15 minutes and up to 2 hours.You can make this ahead and refrigerate, but do remember to take out of the fridge on time so it isn’t too cold. To unmould, dip the bottom of the dariole mould into hot water for about 5-10 seconds. I run a sharp knife around the edge on the top before I do this. Put a saucer or small bowl on top and flip the pudding and saucer/bowl. 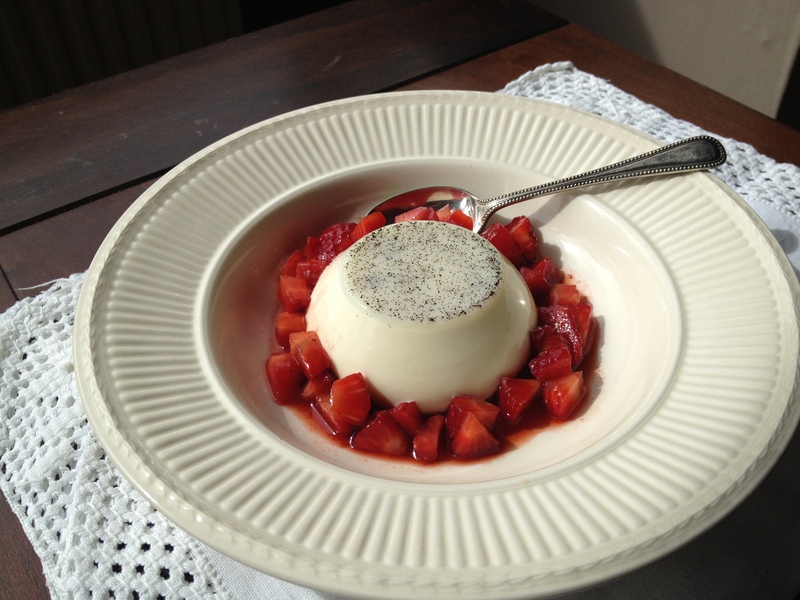 Pour small spoonfuls of the macerated strawberries around the panna cotta.